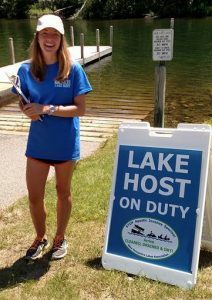 We invite groups that have participated during previous years and NEW groups to apply now for a payroll grant to implement the NH LAKES Lake Host Program at boat ramps on lakes, ponds, and rivers throughout New Hampshire during summer 2018. Through this aquatic invasive species education and prevention program, since 2002 thousands of volunteers and seasonal employees have together conducted 945,917 courtesy boat and trailer inspections and captured 1,572 fragments of aquatic invasive species that were about to be launched into or were just taken out of a waterbody! The number of additional ‘saves’ that Lake Hosts have made by encouraging boaters to always take time before and after boating to clean, drain, and dry, even when a Lake Host isn’t at the ramp to help them, is immeasurable. For more information visit, www.nhlakes.org/lake-host. This entry was posted in Announcements/Events, General, Other Funding Sources, Public Involvement/Outreach and tagged aquatic invasive species, community, grant, lake, outreach, volunteer. Bookmark the permalink.